McDonald's introduces new Breakfast Bowls and switches to Chobani Greek Yogurt in their parfaits and McCafe Smoothies at 800 Southern California restaurants. The move marks an expansion of an earlier test spotted last year. There are two Breakfast Bowl options: the Egg White & Turkey Sausage Bowl and the Scrambled Egg & Chorizo Bowl. The Egg White & Turkey Sausage Bowl features a turkey sausage patty, egg whites, and sauteed baby spinach and kale, topped with shavings of Parmesan cheese and bruschetta. I tried the bowl while it was still being tested last year. You can find my review of it here. The Scrambled Egg & Chorizo Bowl includes hash browns, scrambled eggs, and chorizo (sausage), topped with shredded cheddar and jack cheese and pico de gallo. A cup of roasted salsa roja comes on the side. I also tried this one last year. The bowls offer a more protein-heavy breakfast option compared to McDonald's regular breakfast sandwiches. For example, the Egg White & Turkey Sausage Bowl rings in at 27 grams of protein compared to 17 grams of protein in the similar Egg White Delight McMuffin. Both are 250 calories. The suggested price for the bowls is $4.39 each. The switch to Chobani Non-Fat Vanilla Greek Yogurt in lieu of the low-fat vanilla yogurt (that you'll find at McDonald's in other markets) applies to McDonald's Fruit 'N Yogurt Parfait and McCafe Smoothies. My local McDonald's is also featuring a larger portion of Greek yogurt topped with blueberries and granola and calling it the "Blueberry Yogurt Crunch." 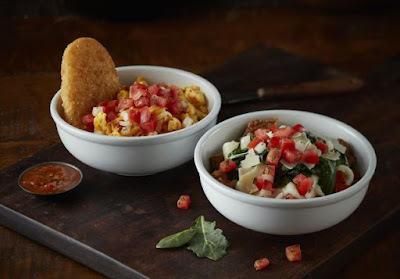 The smoothies, parfait, and turkey breakfast bowl are being marketed as part of a new "Simple Delights" menu of better-for-you McDonald's menu items.